Robbie Rogers, Men's national team standout and former Columbus Crew and Leeds United player returned to action last night with the LA Galaxy in a game versus the Seattle Sounders. Scarcely three months ago, Rogers shocked the American soccer scene when he announced early retirement at the age of 26 and revealed to the world that he was gay. Soon after coming out and having returned to America after a one-year stint in English soccer, Rogers was training with the LA Galaxy. It became clear to the soccer media that there was a possibility for Rogers to return to the field in MLS but questions still remained, specifically with his rights being owned by the Chicago Fire. Just this past week it was announced that Rogers had been signed by the Galaxy following a trade that sent Mike Magee to Chicago. It is worth remembering that Magee is LA's current top scorer and also a clutch player for them in the post-season for the past 4 years. 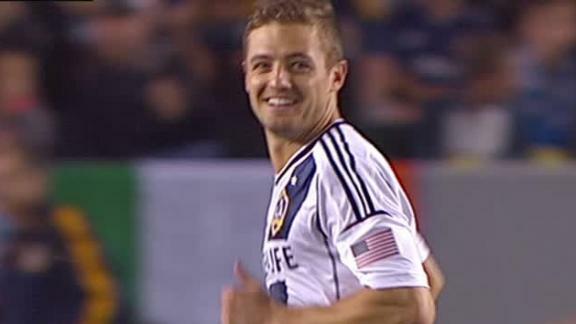 But Robbie Rogers stole the show in his debut not necessarily with his play--he needs time to be match fit. Instead, Rogers became the first gay pro-athlete in any sport actively participating in competition. In a time when gay marriage is gaining significant traction in many parts of the country and it has become mainstream for the great majority of young people, Rogers' adventure is all the more significant. We now celebrate Robbie Rogers' accomplishments on the field and off. He is the young winger Bruce Arena has been looking for his team to provide width and enable Keane, Donovan, Zardes and Villarreal room to move. He is also a trailblazer for the LGBT community and society as a whole. We are all one people, friends, brothers and sisters, mothers and fathers, uncles and aunts, cousins and grandparents. We are humanity and are free to love whomever we desire, for that is our purpose in life and it makes us eternal. Cheers to the brave Mr. Rogers, welcome back to the MLS neighborhood.